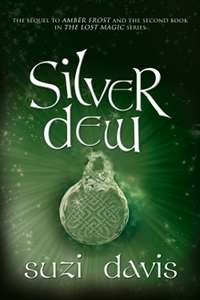 Overall, my feelings towards Silver Dew were similar to Amber Frost: it had some good things going for it but some negatives too. In this second book, there was still some issue with unbelievable dialogue and I felt the pacing was also a little off, with some sections whizzing by and others dragging, but the storyline remained interesting and I liked the introduction of the new characters. Getting to the end, I was interested to see that it finished in a fairly final way. Sure there are still some elements to take over into book three, but it felt like it could have finished there and I wonder if the third book wasn't planned at the time. Anyway, I am now beginning the last book and am intrigued to see how the story will finally end for Grace and Sebastian.